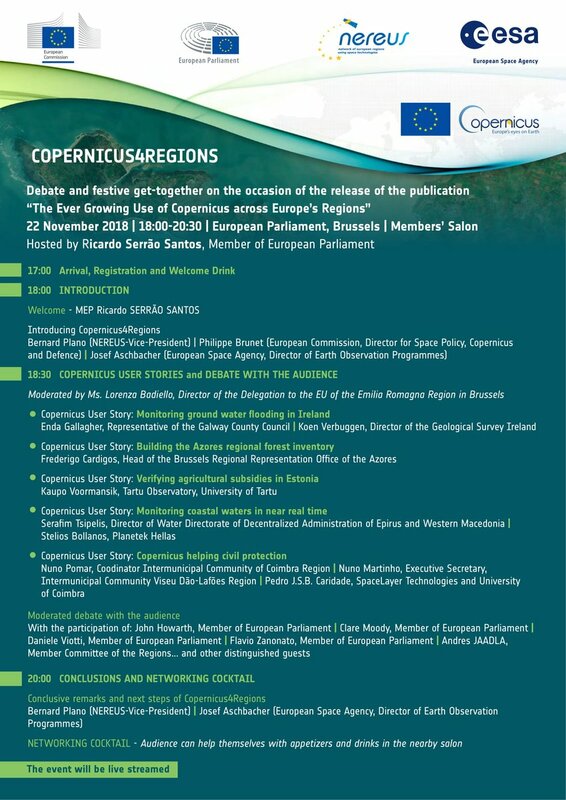 LAUNCHING THE COPERNICUS4REGIONS PUBLICATION. Thursday 22 November 2018 - h. 18.00–20.30. Members’ salon, European Parliament, Brussels. Discover how public authorities benefit and innovate from using the European Union Copernicus programme. In the frame of the Copernicus4Regions initiative, launched by the European Commission, the European Space Agency and NEREUS, NEREUS is holding a high-level political event at the European Parliament in Bruxelles on the 22th of November 2018. The Copernicus4Regions event is a milestone of the collaboration, as it builds on the call for Copernicus User Stories by local and regional authorities and launches the paper Publication “The Ever Growing Uses of Copernicus Across Europe’s Regions”. The audience will have the opportunity to discover how public authorities benefit and innovate from using Copernicus, the European Union’s flagship Earth observation programme. Concrete user stories will be staged and pitched, and will serve as a basis for the moderated debate with the audience in the presence of Members of the European Parliament. Free copies of the publication will be distributed and shared with the audience in different ways. Planetek Hellas and Planetek Italia will join the event showcasing its best practices and case histories with local and regional users based on the use of Copernicus data and information services. In detail, in Bruxelles two Planetek case histories have been selected and invited for a presentation in front of the international audience of the European Parliament. Planetek Hellas and the Water Directorate of Decentralized Administration of Epirus and Western Macedonia will present "Monitoring the Eutrofication Risk in the Coastal waters of the province of Thesprotia (Region of Epirus, Greece)". At the event have been invited also Planetek Italia and MM SpA, which will present "Monitoring the health of water and sewerage networks in Lombardy Region, Italy". Further Planetek case histories have been selected and included in the publication “The Ever Growing Uses of Copernicus Across Europe’s Regions” illustrating the use of Copernicus data.